However, we know the climate models that the IPCC used to calculate these remaining budgets (the CMIP5 models) have missing feedbacks and their estimates of temperature rise were underestimates. This means the carbon budgets for given temperature rises are too generous and should be taken as upper limits. The UK Government aims at a peak temperature 2°C? Two degrees is a prescription for disaster that’s actually well understood by the scientific community… This number was chosen because it was convenient. It was thought that will give us a few decades so we can set targets for the middle of the century. What the science tells us is that we have an emergency This is actually a global crisis and the science for that is crystal clear. We need to help people focus on the solutions that work, that add up, that keep the global temperature rise within 2 degrees C. The UK’s approach has been to set in law an ambitious target to reduce emissions by 80% by 2050. For the sake of argument, let’s examine the optimistic view that 2˚C is safe and the remaining carbon budget per person for 2˚C. The governments aim in cutting emissions by 80%, takes our emissions down to 4 tonnes CO2e by 2050. If the UK’s carbon emissions starts at 20 tonnes CO2e per person in 2015 and reduces evenly to 4 tonnes in 2050, our projected carbon emissions to 2050 are 420 tonnes Co2e per person: well over three times our share of the (optimistic) remaining carbon budget of 115 tonnes CO2. On linearly declining carbon emissions, we will have exceeded this budget in a little more than six years. Could even the unrealistic option of cutting emissions to 4 tonnes immediately get us within our share of the global budget? The answer is no: 4 tonnes CO2e for the 35 years to 2050 is 140 tonnes of CO2e. James’ Hansen has proposed a Carbon Fee which would tax carbon and return all the proceeds to citizens as monthly cheques. Carbon fees then reduce carbon emissions through a price mechanism, allowing the market to do work. A price high enough would bring very large reductions in carbon emissions. Given the strong link between consumption between consumption and carbon emissions, the effect of Hansen’s scheme on individual households would be to penalise those with higher consumption and reward those with low consumption. This means it would take from the rich and give to the poor. The term “fee” is used to avoid using the word “tax” to emphasise that the proceeds are not spent by governments but are given directly back to citizens, defusing political objections to “big government”. So [Fee&Dividend] is not a global cap. Therefore it is – however simple and honest – by definition not a global solution. Contraction and Convergence strategy consists of reducing overall emissions of greenhouse gases to a safe level (contraction), resulting from every country bringing its emissions per capita to a level which is equal for all countries (convergence). C&C gives a framework for countries to negotiate their relative obligations for carbon reduction but it does not specify what happens inside the countries: As long as a country kept to its budget of carbon emissions it could allow a few to use a large proportion of their country’s converged budget leaving the rest with little. In a international context, the Carbon Fee and Dividend could be a way implement a similar scheme to C&C. An increasing carbon price would be internationally set and fees collected from countries according to their carbon emissions and distributed the revenue according to their population. However, such a scheme is likely to be opposed by powerful interests resisting payments from the rich countries to poor countries. Both Hansen and Mayer implicitly recognise this issue. Hansen appeals to the majority of the voters in the United States without mentioning possible international payments. Mayer avoids price mechanisms that involve payments. Both schemes give the high polluters time mend their ways: Hansen by starting with a low fee which is gradually raised and Meyer by extracting promises from nations that they will do better in the future. Neither envisage high polluting countries making payments to the low polluting ones. Being cynical, I interpret the GCI tag line “Climate Justice without vengeance” as a message to the rich powerful countries: “We know you have screwed the climate but your power means that we have to let you off”. Three or four decades ago we could have said “Forgive them Father, they know not what they do.” but for some time the rich nations have been well aware of the climate damage they cause … but still keep polluting big time. Continuing the cynicism, is Hansen’s avoidance of the international dimension because Fee&Dividend between nations would be too high a price for the most powerful nation in the world? What if we ignored the emphasis that these schemes put on the world as a collection of nations? What if a Fee&Dividend scheme were applied to all the people in the world – ignoring national boundaries? Each world citizen would pay a fee to a carbon fund. Each world citizen would receive a dividend from the fund. Oddly, without recognising it, a small group of people in York started to do this in 1992, called the Pollution Tax Association. We pay a small carbon fee and have given the proceeds to charity, mostly to charities giving help to the poor of the world. As the poor have much smaller carbon emissions than average they should gain much more than our meagre donations … but it’s a start. Do remember the name World Wide Fee and Dividend (WWF&D) and that a gradual introduction would give a form of Contraction and Convergence. Postscipt, September 2015: WWF&D inside a Climate Club. This is and excellent idea – but it would be more direct to apply a system that paid contries not to pollute. Within the club, a carbon tax would finance payments to all citizens. This would be an international version of Hansen’s Carbon Fee and Dividend. If for administrative reasons, it is necessary to make payments internal to each nation, balancing transfers between countries will be made. For a two nation club, there would be payments from the country with the higher average carbon footprint to the country with the lower one. 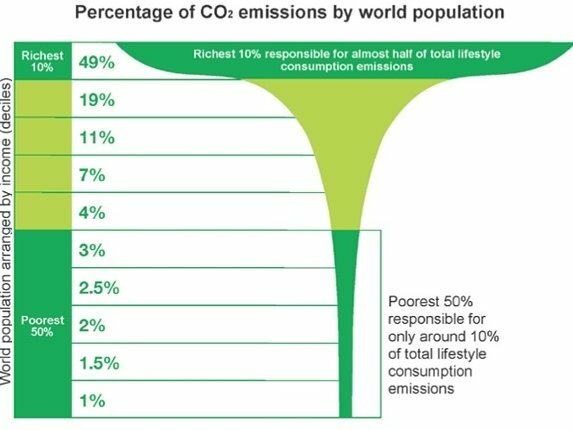 The incentive for the poorer nations, with lower carbon footprints, would be the transfer payments from the wealthier nations. The poorer nations (like Indonesia) would be paid to keep their pollution low. The incentive for the wealthier nations would be avoiding the effects of dangerous climate change. For nations ouside the club there would be tariff barriers – perhaps related to the carbon content of their imports.